It all started on November 14, 1856 when John and Harriet Miller arrived in what would be later named Boyne City. The community’s historic roots run deep and its appreciation for its colorful past is treasured and celebrated. For a trip through the community’s past a visit to the Boyne City Historical Museum is a must. You will get a feel what it was like for the Millers, how industry along the lakeshore took hold, and how the community has transitioned into what it is today. A significant achievement for downtown Boyne City was its listing on the National Register of Historic Places. The downtown historic district includes the 100 and 200 blocks of Water and Lake streets, parts of Main Street between Lake and Park, the 100 block of South Park, and the local Pearl Street Historic District. The National Register is the federal government’s official list of properties that are deemed to be worthy of preservation because of their importance in American history and culture. National Register designation provides recognition and, most importantly, allows property owners to take advantage of Federal Historic Tax Credits to maintain and improve their buildings. As a result of the respect for preserving its historic buildings and Victorian-era homes, downtown Boyne City is recognized on the National Register of Historic Places. The historic district includes the 100 and 200 blocks of Water and Lake streets, parts of Main Street between Lake and Park, the 100 block of South Park and the Pearl Street Historic District along the Boyne River. The first phase of our historic walking tour includes the downtown commerce area. 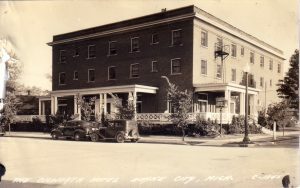 Funded in part by a grant from the Michigan Preservation Fund of the National Trust for Historic Preservation and Michigan Historic Preservation Network, the tour includes stops at 52 buildings in downtown Boyne City. Click here for color brochure. The second phase, completed in June 2016, includes residential, churches and parks. Click here for color brochure. The walking tours are available with a printed brochure, online, or a downloadable app on your iPhone – search Boyne City on iTunes. Click here for building histories. Best efforts were made to ensure historical accuracy. We welcome your insights, corrections and additions. Mainstreet@boynecity.com. 13 – Boyne Trading Co.